Earlier this year, Real Networks launched two of games from their popular game series Cake Mania on Windows Phone. One in particular was announced as an upcoming Xbox Live title but was then just published as an indie game. Grab a baker’s dozen of fun in the highly anticipated sequel to the hit series! Help Jill and her friends get Main Street buzzing once again. Main Street has turned into an avenue of deserted shops and closed storefronts thanks to Baker’s Corner, a new corporate mega mall. The days of families shopping in her old hangout are gone, but Jill isn’t about to give up yet. With healthy determination and lots of luck, Jill and her friends are about to undertake an impressive renovation project that will bring the shoppers back to Main Street. Jump into the cake mix with Jill and get the dough rolling once again. Purchase, open, manage and upgrade four unique shops like the Evans Bakery, Risha’s Flowers and Tiny’s Sumo Sushi. 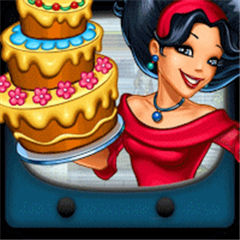 Bake cakes, create floral arrangements, serve 40 delicious recipes and more in 100 fast-paced levels. With hilarious new customers, fantastic upgrades and incredible tourist attractions to build, restoring Main Street will be the most rewarding challenge yet! • Help Jill and friends restore Main Street in this fun Time Management Challenge. • Purchase, open, manage and upgrade four unique shops in 100 fast-paced levels. • Bake cakes, create floral arrangements, serve delicious recipes and more! • Build incredible tourist attractions to bring the shoppers back to Main Street! Jill Evans is back for fast-paced, frosted fun on a new reality show in Cake Mania Celebrity Chef Jill’s delicious cakes have become so popular that she’s been invited to appear on Cake Mania Celebrity Chef, a culinary competition taking place in exotic locations around the globe! 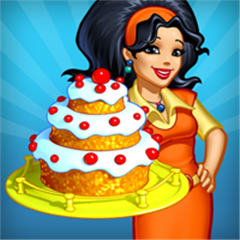 Help Jill bake her way to the top by whipping up cakes for her quirky customers in more than 50 exciting levels. Stack, serve, and catch cakes in three all-new mini-games and climb to the top of the Cake-o-Meter by completing fun milestones. The Cake Mania series has been played by millions of casual gamers, and critics love it too: Pocket Gamer gave the original mobile version an 8 out 10, and IGN called it “impressive.” Now Jill Evans is back and ready for the bright lights in this all-new chapter of the smash hit. Do you have the swift strategy and fast fingers it will take to help Jill earn the title “Cake Baker Champion”? Find out in Cake Mania Celebrity Chef! Play the latest chapter of this hit series today! Amazing graphics and fun sound effects take full advantage of your mobile phone. Written by: Hyde13 on March 12, 2012.